I recently saw a show on Food Network called All American Festivals. 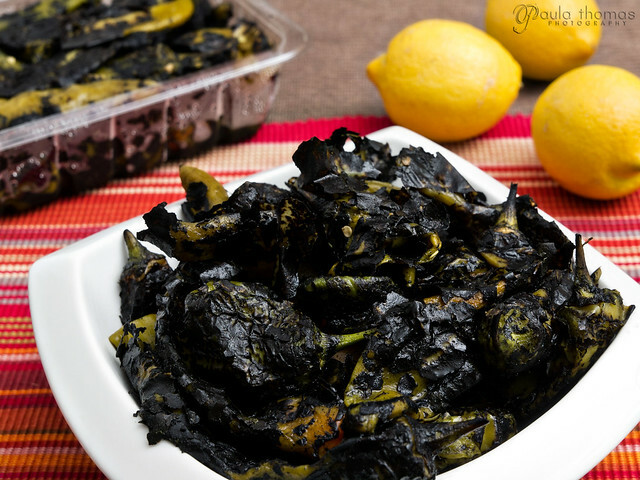 This episode featured the Hatch Chile Festival in New Mexico. 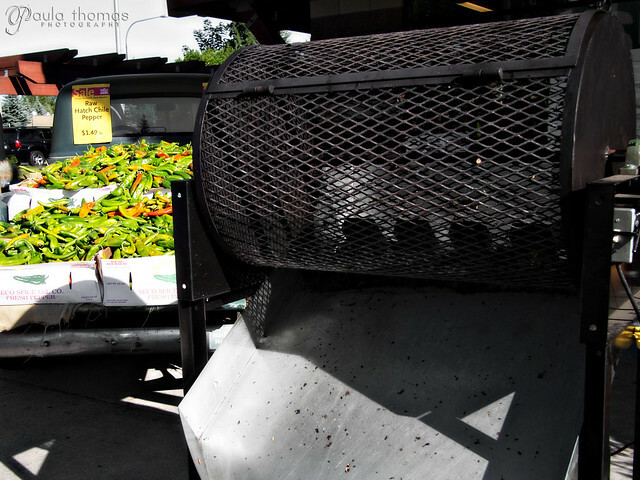 They are pretty famous chiles, so famous that they showed up recently at Whole Foods. They had a big chile roaster set up and everything. They were selling for $2.99/lb roasted when I got them a few weeks ago. I was just in a Whole Foods in downtown Seattle over the weekend and they had them on sale for $1.99/lb. I was tempted to get more but didn't. I bought a couple containers of them a few weeks back and used one in a batch of green chile and the other is hiding away in my freezer. I'm not sure if I will make more green chile or find something else to do with them. Surprisingly, I had never made green chile before which I'm sure my family is thinking "it's about time". My mom makes it every year and sometimes sends me some from Montana. I even got her a chile roaster for her birthday this year because I know she's been wanting one. She has a decent sized garden and plants lots of chiles. She has already used it a few times and loves it. I did some searching online for a recipe and found this Colorado Green Chile one on my favorite recipe site, allrecipes. It got 4.5 star review and sounded pretty good. I did make a few changes to the recipe. I modified a couple of the measurements and used beef instead of pork. 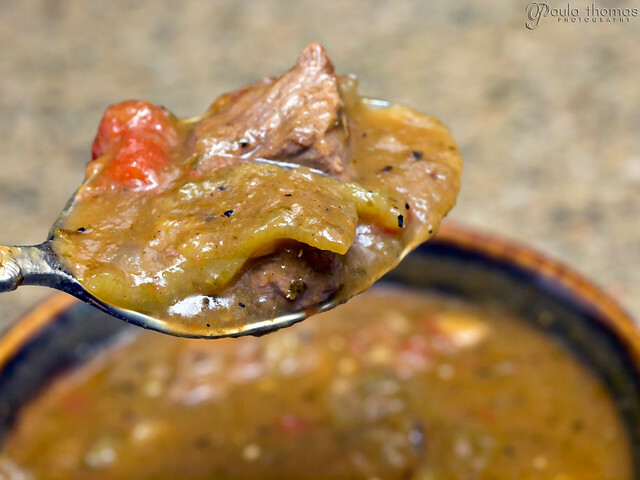 I had planned on getting pork but accidentally bought beef stew meat instead but either one is fine to use for green chile, but I usually prefer pork to beef in my soups and stews. 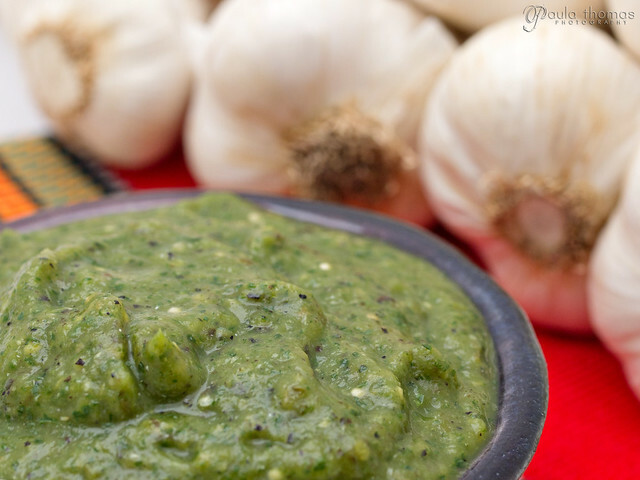 I added extra jalapenos and a few chiles I had growing in my garden that I thought were jalapenos but look more like serranos to the Roasted Tomatillo and Garlic Salsa that I also made from scratch using another recipe from allrecipes. I won't post that recipe here since the only modification I made was adding more chiles. I like my chile spicy and the green chiles are pretty mild. Here is my modified recipe. 1. Heat the oil in a large pot over medium-high heat. Season the meat with salt and pepper to taste, then place into the hot oil. Cook until golden brown on all sides, about 7 minutes. Once browned, remove the meat and set aside. Reduce heat to medium, and stir in the onion and garlic. Cook and stir until the onion has softened and turned translucent, about 5 minutes. 2. 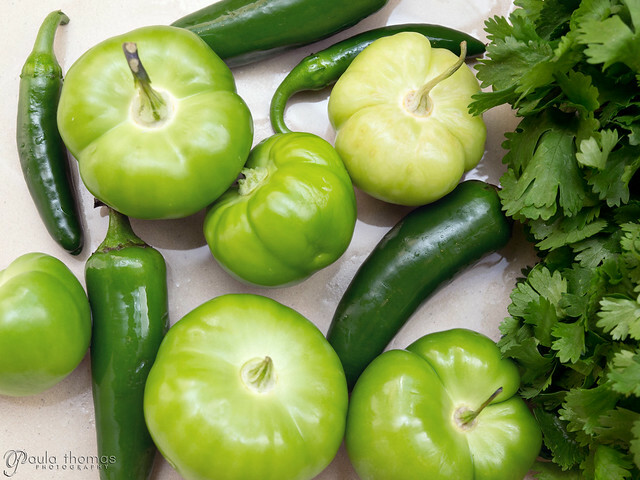 Return the meat to the pot, and stir in the green chiles, diced tomatoes with juice, tomatillo salsa, and chicken broth. Season with oregano and clove. Bring to a simmer over medium-high heat, then reduce heat to medium-low, cover, and simmer 20 minutes. 3. After 20 minutes, remove 2 cups of the soup (ensure there is no meat in it), and pour into a blender. Hold down the lid of the blender with a folded kitchen towel, and carefully start the blender, using a few quick pulses to get the soup moving before leaving it on to puree. Puree until smooth, then pour back into the cooking pot. This will create a thicker texture for your chili and will eliminate some of the chunky bits of chiles. Continue to simmer, stirring occasionally until the meat is very tender, at least 40 minutes more. 4. Serve as a soup in a bowl garnished with a few cilantro leaves or it can be used as a sauce over enchiladas, tamales or burritos. It's even better on the second day but if you don't plan on eating within a few days it freezes well.